Quinn’s involvement with the Fair’s Sticker Contest began 22 years ago and today he has produced more than 500,000 stickers featuring winners’ artwork. And, as if that were not enough, each year he writes checks to the winners, sending a strong message to each child that their creativity is valued. Quinn said one of his favorite Sticker Contest stories came years ago, when he got a letter from a little boy who said he had always wanted a bicycle and now he had one, thanks to that $100 prize. Quinn’s Santa Rosa Label Company has been in business for 30 years, providing labels and other products to major markets in Northern California and Hawaii. “I feel strongly that children deserve our support and encouragement,” said Quinn upon learning of the award. “I feel fortunate to live in Sonoma County and to have my business here, and I hope I can give as much to this community as it has given to me.” The Sonoma County Fair Board is honored to recognize John Quinn of Santa Rosa Label Company for his long-time dedication and support of the Sonoma County Fair. Quinn, along with his fellow Blue Ribbon recipients, was recognized with the Western Fairs Association Blue Ribbon Award at the annual Awards dinner on May 29th at the Sonoma County Fairgrounds in Santa Rosa. It began at least 25 years ago when the Safeway stores located in Sonoma County and their employees decided to band together in support of the Junior Livestock Auction at the Sonoma County Fair. Each year since, and for over two decades, Safeway has donated products and staff time to provide delicious BBQ lunches for all of the exhibitors during the auctions. And, year after year, an average of eight Safeway employees have worked the two day rotation, serving up hot dogs, chips, sodas and more. Equally of note, and for just as many years, is the support Safeway has given to Sonoma County youth in 4-H and FFA programs by purchasing meat from the lamb auction. Jeff Beltran, who manages the Safeway store in Sebastopol, says Safeway decided to concentrate its efforts in the lamb market in order to help the largest number of young ranchers for the money. “We truly believe that by supporting our youth we’re investing in the future of Sonoma County agriculture,” says Beltran. “It’s an honor to be a part of helping them to reach their goals at market. And, we feel especially gratified knowing that their success at the Junior Livestock Auction often leads to even greater achievements in college and in their careers.” The Sonoma County Fair Board and Staff are honored to recognize Safeway’s Sonoma County stores for their dedication and support with a Western Fair Association Blue Ribbon Award. Baze has played a major role in Wine Country Racing at the Sonoma County Fair for the majority of his career. He has celebrated several career milestones at the Fair, such as his 11,000th win on August 14, 2010 and claiming every stake race ever offered by the fair. And, he’ll be riding again this year at the Sonoma County Fair. Born in August of 1958 in Vancouver, British Columbia, Canada, Russell Baze has the most wins in North America racing history with over 12,500 wins and counting. He’s won 400 plus races in a year on 11 occasions. To give you some perspective, no other rider has had 400 plus wins in a year more than three times, and in 1992 he won seven races in a single day at Golden Gate Fields. The Sonoma County Fair Board is honoring Russel Baze for his long-time dedication and support of the Sonoma County Fair. Baze along with his fellow Blue Ribbon recipients was recognized with the Western Fairs Association Blue Ribbon Award at the annual Awards Dinner on May 28th at the Sonoma County Fairgrounds in Santa Rosa. Larry McClure gave 32 years of hard-work and excellence to the Sonoma County Fair. In addition to his legacy as a dedicated leader, he also found love while working for the Fairgrounds and married Fair employee Kathleen, his wife of 34 years. Now retired, McClure enjoys looking after his grandsons, spending time on his boat and going camping, and of course keeping his home in tip top shape. The Sonoma County Fair Board is honored to recognize Larry McClure for his long-time dedication and support of the Sonoma County Fair.
. A hard-working farm boy of simple up-bringing, Neumiller now heads vineyard operations for world-class winemaker Seghesio Family Vineyards and, yet, finds time to inspire and guide young farmers in the career path and agricultural way-of-life he loves. He is honored for contributing countless hours and tireless energy to teaching top-notch animal husbandry to young ranchers, for his exceptional support of the Sonoma County Fair and the fair’s Junior Livestock Auction, and for his outstanding dedication to enhancing and promoting the county’s agricultural community. Neumiller’s early experiences led to a leadership role with the Sonoma County Fair as Livestock Superintendent. Jim held and mastered the position over many years, managing a multitude of details from contracting judges to animal weigh-ins to ensuring the shows went off without a hitch. For over a decade, he expertly oversaw the well-being of thousands of animals, guided the education of hundreds of young exhibitors, and touched the lives of countless fairgoers. “I am honored to be recognized by the Sonoma County Fair and feel that it has played an important role in my life,” says Neumiller. “I look forward to my grandchildren showing at the fair in a few short years. We are blessed to be able to participate in such a rich, community tradition.” The Sonoma County Fair Board and staff are proud to dedicate the 2015 Exhibitor Guidebook to Jim Neumiller—outstanding leader and champion for the future of Sonoma County’s agricultural industry and community. A fifth generation rancher operating in Sonoma and Mendocino Counties and Sonora, Mexico, John Serres grows wine grapes and blueberries, runs two working and hunting ranches, and operates a construction company. From his home base nestled in the Valley of the Moon, Serres served 15 years on the Sonoma County Fair Board of Directors, from 1996 to 2011, and served as the President of the Board in 2004. His fellow board members would tell you that when John spoke, people listened. And, when it came time to build the new horseracing turf track at the fairgrounds, his expertise in construction and his take charge manner boded exceptionally well for the Fair. As an engineering contractor, Serres helped with everything from the drainage system to the finishing touches. And, at the end, against deadline, he pulled 6 to 8 of his own men and donated the time, labor and equipment to get the job done. Serres’ additional contributions to the Sonoma County agricultural community include support for 4-H and FFA participants in the Junior Livestock Auction, support for the Hanna Boys Center, the Sonoma High School Agriculture Department and the Sonoma County Farm Bureau scholarships program. The Sonoma County Fair Board and staff are pleased to dedicate the 2015 Hall of Flowers to one of the Fair’s most committed supporters and an outstanding champion of Sonoma County agriculture, John Serres. 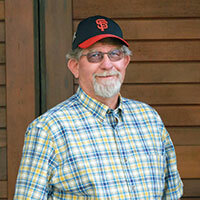 Raised in Stewart’s Point and Cazadero, Michael Furlong represents the best of two worlds. His pioneer family began in the dairy business and later diversified into beef cattle. As soon as he was able to stand, Michael learned the tried and true traditions of his family’s rich history. He incorporated those practices with modern thinking and today embodies the best of Sonoma County ranching, producing beef that’s approved by the Global Animal Partnership (GAP) and meets the highest level of industry standards. Furlong’s earliest memories are of being in the fields with his parents and their animals. He received his first two cows when he was five years old and by high school he had a herd of fifteen. He earned his associate’s degree in Animal Science from Santa Rosa Junior College, but says the business of ranching is more a part of his DNA than acquired knowledge. To this day, he can tell you a story about every animal he owns on sight. Coincidentally, the Sonoma County Fair named Furlong’s dad Outstanding Rancher in 1982, when Mike was the age of his kids now. “I’m grateful to carry on our family’s heritage and with children of my own now, I’m especially committed to keeping our youth interested in agriculture,” he says. Furlong is a nine-year board member of the Sonoma Marin Cattlemen’s Association and is the organization’s current president. He is exceptionally proud of his family’s participation in the Range to Table program, donating beef to help families in need. The Sonoma County Fair Board and Staff are proud to present the 2015 Outstanding North Bay Rancher award to Michael Furlong Jr.
Albert and Vicki mark the third generation of dairy farmers in the Mello family. Growing up on his parents Santa Rosa farm, Albert worked the dairy from childhood. He was a member of 4-H and FFA and showed lambs and beef cattle at the Sonoma County Fair. In 1979, Albert took over operations from his father, beginning with just 11 cows. He and Vicki now have a herd of 275, all of which were born on the ranch. In 2007, they transitioned their herd to Certified Organic and today ship their milk to Wallaby Yogurt Company in American Canyon. "We always pastured, never used pesticides and found homeopathic cures that work great. We know that if you take good care of your animals, they will take good care of you,” says Albert. For Albert and Vicki, family tradition and preserving the county’s dairy heritage are high priorities. Their three children were raised on the ranch and each showed animals at the fair. Their son Mike now owns an organic dairy next to theirs. They believe it’s important for all kids to see where their food comes from and regularly open their farm to school children. Albert is active with Western United Dairymen, Native Sons of the Golden West, and the Sonoma County Farm Bureau as part of the Animal Resource Committee, which helps to monitor water quality in the county. Vicki belongs to California Women for Agriculture and North Bay Dairy Women. 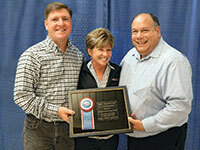 The Mello’s longtime commitment to the industry has earned widespread respect from their peers. The Sonoma County Fair is pleased to name Mello Dairy the 2015 Outstanding Dairy of the Year. Raised in Sebastopol, Bruce Martin was a member of the Sebastopol Wranglers and was soon introduced to fellow Wrangler and fellow high school sophomore, Connie. Connie grew up on a family ranch in Cotati dating back to 1919. She learned to ride early and participated in pleasure, trail, and later cutting events. She and Bruce attended Santa Rosa Junior College and Chico State University, with Bruce earning his Bachelor of Science degree in Agricultural Business. The pair settled in Cotati, where Bruce worked as an agricultural appraiser and the couple raised two sons. For pleasure, the family rode trails together and the boys participated in horse events, 4-H, and at the Sonoma County Fair. 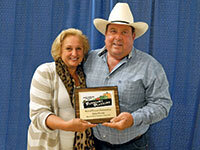 During the 1970s, Bruce and Connie opened Martin Ranch Supply in Rohnert Park. 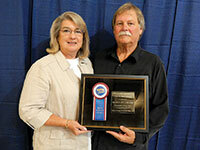 For 30 years, they manufactured and sold horse and livestock equipment and forged a lifetime of friendships. Bruce’s unique talent for crafting custom products made him especially beloved and changed the face of the county’s agricultural landscape. Bruce joined the Sonoma County Trailblazers and served on the advisory committees of the Agricultural Departments at Petaluma and Vintage High Schools and Santa Rosa Junior College. Meanwhile, Connie and friends hosted Friday night schooling shows at the Sonoma County Fairgrounds. She formed North Bay Horse Shows with partner Carol Clothier and went on to present hundreds of horse shows at the fairgrounds, including the largest Western Pleasure Futurity on the West Coast at the time. Now enjoying retirement, the couple’s business is still going strong under new ownership. Their son Gary heads manufacturing and daughter-in-law Kim runs the office. Bruce and Connie remain active in the horse community and together have created a legacy of contribution shaping Sonoma County’s equestrian industry today.